Great gutter services begin with a knowledgeable team of experts. 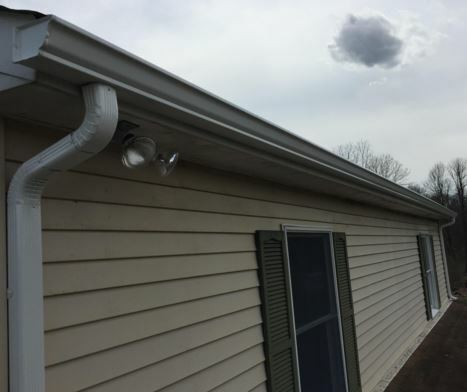 Whether it's a clogged drain spout or a a lack of gutters that needs to be installed to prevent damage to the home, there are many services Elkhart Gutter Pros can provide. It is important to call professionals earlier on rather than later before things get truly serious and the cost of repair gets to be too high. Below is a basic list of what services are offered. Lightweight and easy to install, aluminum gutters have many advantages older gutters do not. For one thing, aluminum won't rust or corrode. It can also be easily painted. Choose from a variety of different colors that compliment any siding color. Another perk about aluminum gutters is that they are also highly affordable. Downspouts keep rainwater away from the house to prevent water damage from accumulating. Sometimes though these gutters can become clogged or the seams can suffer damage over time. Downspouts can also pull away from a building's structure. Installing a recoiling downspout extension will keep water way from the nearby building and prevent further soil erosion. Built up debris and other objects within gutters can lead to cluttered downspouts. Regular cleaning can prevent this. Elkhart Gutter Pros have the skills to perform this duty quickly and efficiently. Gutters do not all come in one standard shape or size. That is why professionals can be of so much use. This is especially true if a home has been recently purchased that does not have any at all (such as a foreclosure home that may need outside repair). Elkhart Gutter Pros can offer solutions to all of your gutter needs. Like most things in life, gutters require regular maintenance. This includes a periodic inspection, cleaning, and repairing any minor issues before they become much more expensive, larger ones. For those that own their own ladders, cleaning out old debris and collections of leaves might be easily done on a weekend when not in work. It doesn't take long to do. Gutter repairs don't have to be costly. If caught early enough the repairs are minor. Most homeowners can do these themselves but for those that can't or are uncomfortable with the task, call Elkhart Gutter Pros. However, if the gutters seem loose at all when running a hand through them or they're leaking due to bad seals, it may be time to call in the professionals. Heated gutters do not prevent ice dams. Since this is an internal issue, it can be caused due to a ventilation or insulation issue. It might sound like a good idea but heated cables are not the answer. Contact the professionals at Elkhart Gutter Pros for advice and further instruction.